Learning Objective: State the operating principles and identify the components and the maintenance for a clutch, a manual transmission, an automatic transmission, and a transaxle. In a vehicle, the mechanism that transmits the power developed by the engine to the wheels and/or tracks and accessory equipment is called the power train. In a simple application, such as a stationary engine-powered hoist, a set of gears or a chain and sprocket could perform this task. However, auto- motive and construction equipment are not designed for such simple operating conditions. They are designed to provide pulling power, to move at high speeds, to travel in reverse as well as forward, and to operate on rough terrain as well as smooth roads. To meet these varying conditions, vehicle power trains are equipped with a variety of components. This chapter discusses the basic automotive clutch, transmissions (manual and automatic), and transaxles (manual and automatic). Learning Objective: State the operating principles and identify the components and maintenance requirements for an automotive clutch. With a few exceptions, the clutches common to the Naval Construction Force (NCF) equipment are the single-, double-, and multiple-disc types. 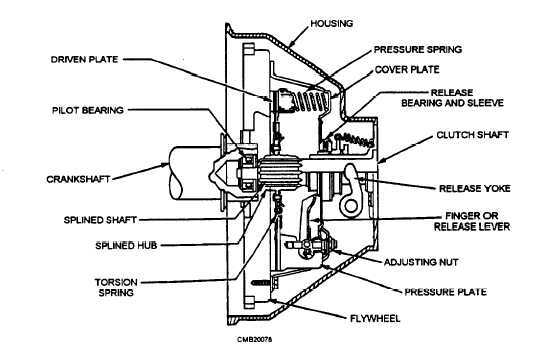 The clutch that you will encounter the most is the single-disc type, as shown in figure 4-1. The double-disc clutch (fig. 4-2) is substantially the same as the single disc, except that another driven disc and an intermediate driving plate are added. This clutch is used in heavy-duty vehicles and construction equipment. The multiple-disc clutch is used in the automatic transmission and for the steering clutch used in tracked equipment. Figure 4-1. - Single-disc clutch.